The mission of Soaring Heights Charter School is to prepare a growing number of students for a lifetime of learning as productive citizens in the technological age by training them how to communicate and listen effectively, think critically, solve problems, act responsibly, value their accomplishments, and achieve a high level of academic excellence. By integrating communication training into every aspect of school life, faculty and staff create a safe, open learning environment, and develop positive productive relationships among students, parents, members of the community, and themselves. 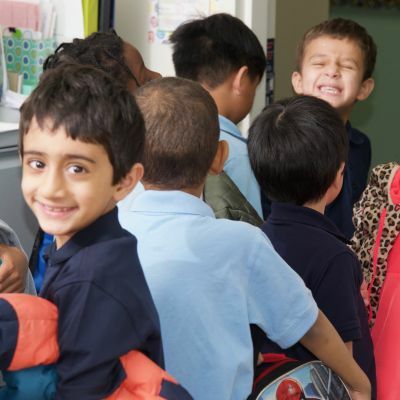 Soaring Heights Charter School, a K – 8 elementary school with an enrollment of 240 children, was born out of Project Safe Harbor, a program Claudia Zuorick initiated in the Jersey City Public School District in the early 1980s. There she developed a program where urban educators could come together and learn how to identify sources of inspiration and motivation, and how to improve their skills. As these teachers gained confidence and became increasingly enthusiastic, they desired a school of their own - a school in which they could teach and learn together, a school in which they could pay attention to their human needs and, in turn, be better able to attend to the human needs of the children. What seemed like “an impossible dream” became more than that when New Jersey adopted charter school legislation in 1995. These New Jersey educators saw an opportunity to operate a school where they could do it all - teach, develop the systems, organize the structures, handle the administrative duties, and manage every aspect of school life through a team format. As the teachers increased their self-awareness and recognition of human dynamics, they came to understand both each other and the children so much better - their motivations and desires to be accepted, approved of, and loved. This is because the motivations and desires of children and adults are basically the same. After much planning and preparation, Soaring Heights Charter School opened in downtown Jersey City as one of New Jersey’s 13 original charter schools in September, 1997. The school relocated to Romar Avenue in Greenville in February, 2004 where it is situated today. Soaring Heights has remained steadfast in preserving the philosophy of Claudia Zuorick, and the school’s unconventional shared leadership style allows staff to face problems together, share successes, grow in unity, and move forward to ensure a safe environment and quality education for all its students.